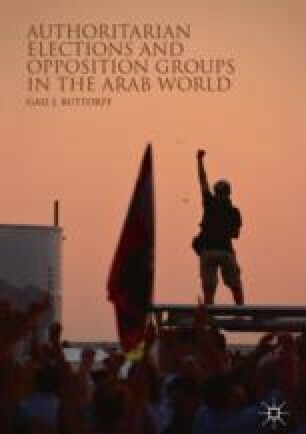 This chapter examines the strategic choices of the Socialist Forces Front (FFS) across two legislative elections (2002 and 2007) and two presidential elections (1999 and 2004) in Algeria. The author shows that although the party had concerns about the freeness and fairness of the electoral process, it was ultimately driven to boycott by its perceptions about regime strength, beliefs which were informed by the social, political, and economic conditions surrounding each election. In this chapter, Buttorff also considers a second political party, the Rally for Culture and Democracy (RCD), since the FFS and RCD adopted the same strategies in 1999 and 2002, but different strategies in the latter two elections. The discussion focuses in particular on how to explain the divergence in boycotting strategies of two parties facing the same electoral conditions and broader socioeconomic context. She concludes with a discussion of key issues raised by the Algerian case about the study of opposition politics in authoritarian regimes. Zisenwine, D. (2007). Algeria’s parliamentary elections: A setback for democratization. Tel Aviv Notes, Moshe Dayan Center for Middle Eastern and African Studies. Retrieved from http://d6.dayan.org/sites/default/files/Algeria%27s_elections.pdf.